To help robots and prosthetic devices attain the abilities like that of human skin, scientists are trying to develop electronic skins. Now, researchers from the American Chemical Society (ACS), report a new method in Applied Materials & Interfaces that creates an ultrathin, stretchable electronic skin, which could be used for a variety of human-machine interactions such as detecting pressure, temperature and other sensations that allow tactile interactions with the environment. 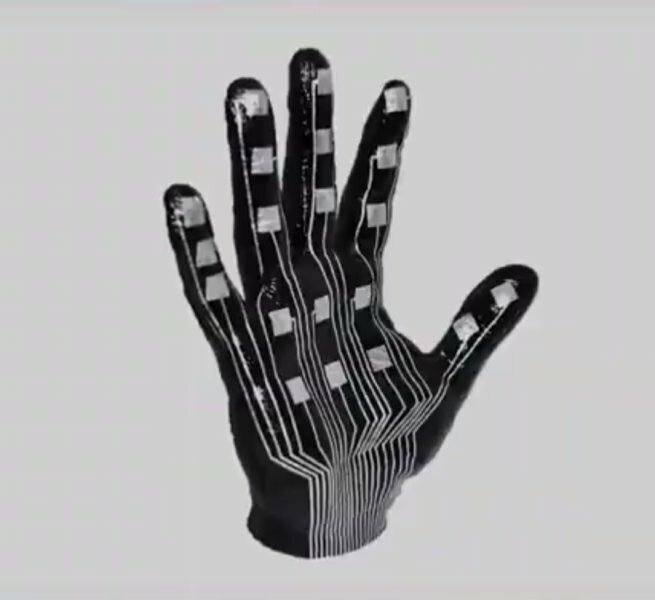 Electronic skin could be used for many applications, including prosthetic devices, wearable health monitors, robotics and virtual reality. A major challenge is transferring ultrathin electrical circuits onto complex 3D surfaces and then having the electronics be bendable and stretchable enough to allow movement. With this new method, the researchers patterned a circuit template onto a sheet of transfer tattoo paper with an ordinary desktop laser printer. Coating the template with silver paste, a special liquid metal alloy, and what they call conductive “glue”, they can make a flexible electronic tattoo and transfer them to various objects. The American Chemical Society research team has demonstrated several applications of the new method, such as controlling a robot prosthetic arm, monitoring human skeletal muscle activity and incorporating proximity sensors into a 3D model of a hand.